A Beechcraft 300, N385KA, was destroyed when it impacted terrain during takeoff from Tucson International Airport (TUS), Arizona, USA. The pilot and the passenger were fatally injured. A witness observed the airplane takeoff from runway 11L and rapidly pitch up in the initial climb. At an altitude between 100-150 feet above the runway, the airplane suddenly yawed to the left while maintaining a nose-up pitch attitude. The airplane then appeared to slow down such that he believed it was about to stall. The left wing dropped, and the airplane rolled left and continued as the nose dropped and the airplane struck the ground inverted. Another witness described the airplane yawing from left to right while climbing. The airplane then rolled left and eventually became inverted, in a manner he described as similar to a barrel roll. The airplane then exited his field of view. After impact, the airplane slid about 650 feet across the ramp on a 060-degree magnetic heading before it collided with an 8-feet tall concrete wall. 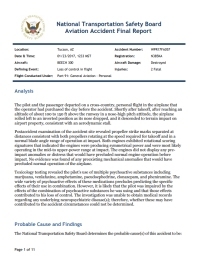 No evidence was found of any preexisting mechanical anomalies that would have precluded normal operation of the airplane. Toxicology testing revealed the pilot's use of multiple psychoactive substances including marijuana, venlafaxine, amphetamine, pseudoephedrine, clonazepam, and pheniramine. The wide variety of psychoactive effects of these medications precludes predicting the specific effects of their use in combination. However, it is likely that the pilot was impaired by the effects of the combination of psychoactive substances he was using and that those effects contributed to his loss of control. The investigation was unable to obtain medical records regarding any underlying neuropsychiatric disease(s); therefore, whether these may have contributed to the accident circumstances could not be determined. PROBABLE CAUSE: "The pilot's exceedance of the airplane's critical angle of attack during takeoff, which resulted in an aerodynamic stall. Contributing to the accident was the pilot's impairment by the effects of a combination of psychoactive substances." UPDATE: The plane that crashed @TucsonAirport is a Beechcraft King Air 300. Distance from Tucson International Airport, AZ to Hermosillo-Gen Pesqueira Garcia Airport as the crow flies is 334 km (209 miles).